I will never forget the moment I had to make the call to my heart doctor and they told me to stay on the line while I called my husband to come home and take me to the ER immediately. My LifeVest (external defibrillator) had just beeped, telling me it was going to go off if I did not hit the response buttons. I remember staying on the line in tears, with the nurse who talked me through what to do. I was literally seconds away from having a possible heart attack. I was scared. Since we chose to drive to the hospital instead of getting an ambulance, Mazy came with us; our 3-year-old daughter, who didn’t have a clue why Mommy had to be rushed to the hospital. It’s not fair to her. parenting went away, and it was just me and her. My husband was in that room too, but no nurse was needed. My daughter gave me what my heart needed. She lifted her purple “soft-side” blankie gently up to my face, as she nuzzled it in next to me. She held my hand and did not leave my side. My heart broke for her. This is not how life was supposed to be. This is not what a 3 year old should have to deal with. EVERY MOM HAS FELT THEIR HEART BREAKING. It doesn’t take a medical scenario to make a mama want to protect her child. I so badly want to protect my child from the ills of this world. To keep her innocent. To keep her heart from getting hurt. But when I try to protect her from all of the hurts of this world, it’s not only her heart that breaks, but mine too. Because I feel like I’ve failed. I feel like I haven’t done a good enough job protecting her. My heart breaks when I know I’ve messed up. When I know I raised my voice. When I know I was short with my daughter. When I know I was rushing around instead of taking the time to show her something. When I know I was rushing HER, instead of letting her learn her independence and figure it out on her own. My heart aches when I realize I’ve done those things. But then I remember that really, we all have. I let my mind think that I’m the “only” mom who does those things, but really, I am like every other mama out there. I am not perfect. But you know what? It’s okay. My friend, it really is. It says in 2 Corinthians 12:9 – But he said to me, “My grace is sufficient for you, for my power is made perfect in weakness.” Therefore I will boast all the more gladly about my weaknesses, so that Christ’s power may rest on me. Instead of trying to walk around like my heart doesn’t ache and that I’ve screwed up, we all have a testimony of how God has worked powerfully in our own lives. 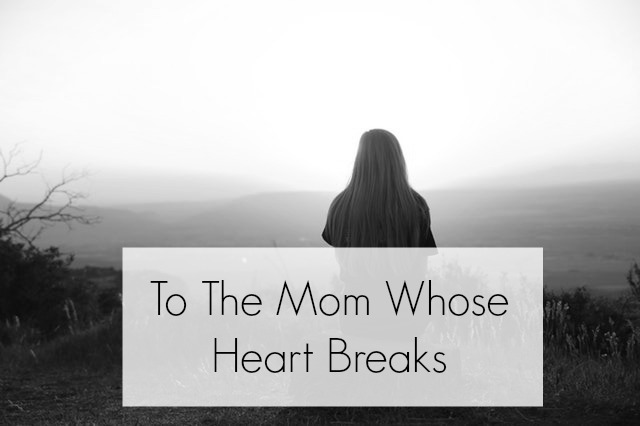 How God has overcome those heart-breaking moments. But are we willing to be vulnerable and honest in sharing about those moments? I felt I let my daughter down that day in the hospital because I couldn’t be the one there for her, but her for me. I felt I couldn’t be the mama I wanted to be and instead, had to listen to her struggle with me being gone. But that moment taught me that there are going to be umpteen other times when life isn’t going to go the way we had hoped. Or that we have let them down in some way. But God’s grace is sufficient. So rest in that power today, sweet friend.